I’m sure by now everyone knows about the cruise ship that caught fire last week and ended up dead in the water. The fire happened early that Monday morning on the Carnival Splendor which is owned by Carnival Corporation. For three days passengers were on the disabled ship without cabin lights, hot water, hot food and, for a day or so, flushing toilets. Yet it was hard for TV crews to find anyone faulting Carnival. Why? The company did three things right that kept this ship’s problem from resulting in a public relations disaster. The ship’s crew was quick, but calm in their response which kept everyone safe. They quickly came up with plans to feed and entertain the approximately 3,000 guests. Everyone had enough food even though the options were limited. The ship’s bars provided no-cost beverages and the staff came up with no-power entertainment. Unfortunately, for sanitation reasons the pools were closed, so no water games! Carnival Corporation offered full refunds and a free future cruise right away. This kept people from feeling they were losing money on a vacation gone bad. Once the company was able to determine where and when the ship would disembark passengers, arrangements were made for transporting passengers to the originating port (Long Beach), the airport or hotels at no cost. Some even decided to enjoy San Diego for a couple of days. The CEO of Carnival Cruise Line, Gerry Cahill, flew to San Diego in advance of the ship’s arrival to greet, and apologize to, passengers. This demonstrated the company’s commitment and conveyed the sense that they cared. The ship is still disabled with cruises canceled until early 2011. However, Carnival Corporation came through the experience with mainly positive press. I’m pleased to own stock in this company. Oh and we won’t be canceling our plans for a future Carnival cruise. This is actually the first that I’m hearing about this. It seems like they did everything right, and I’m glad that everything worked out. I love it when companies do the right thing! Khaleef, I love to share good stories. It’s only human to think about and share the negative; but we need to give praise when deserved! 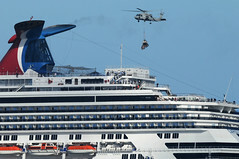 I agree with your assessment of Carnival Cruise Line’s handling of this disaster. I did feel sorry for the people on board, but they should feel adequately compensated for their bad experience. And how important for the CEO to be on hand to personally apologize. I’ve never had anything go quite THAT bad, but have not had much luck as a consumer when I do have problems with a product. I have had customer service representatives (now they seem to be called customer support?) spend more time telling me why they can’t help me than it would probably take to totally fix the problem. Oh well…Kudos to Carnival Cruise Lines for stepping up and offering fair compensation to their customers. Deedee, fortunately the response to this problem was being driven from higher up and it’s clear the C-level staff understand the importance of good customer service. Several years ago on a different Carnival line, we had a customer service problem that we couldn’t get taken care of via customer support. My brother called a senior executive who resolved the problem. I think it’s awesome the CEO showed up to apologize to passengers. There was a time when most comapnies cared about their customers. Now, most comapnies are scheming of ways to take advantage of them. Bret, this fact was very impressive to me as well. Since the ship was docking locally the story had a lot of coverage. The fact that the CEO flew in to greet and apologize to the guests shows the kind of company this is; one that actually cares about their customers! Many times the CEO sets the tone for the company and it trickles down throughout the corporation. It seems he has set a good tone. Little House, I hope this case is studied at business schools in the future as an example of how to handle disasters. I took a Carnival cruise a couple of months ago simply because they were the only ones sailing out of Charleston. Carnival greatly exceeded my low expectations. The spring break party ship atmosphere I was expecting was nowhere to be found. It was great fun. I can think of a lot of companies who need to take a page from Carnival’s customer service book! SimplyForties, I remember reading about your cruise. They are a pretty good company. Each line in the Carnival Corporation has distinct pluses and minuses. Were you living under a rock… or just working hard? I’m betting the latter! Nice article. I thought they handled the whole thing with class. There will always be a few that complain, but I wouldn’t be one of them with a full refund and a future cruise for free!